The game of roulette is one of the most well known and popular casino games and it is natural that online casinos want to make online roulette feel like the traditional form of roulette.The table, wheel, ball and bets are all the same. The only differences come from the convenience offered by online gambling as online roulette players don’t need to leave their homes and don’t have to wait in lines at the casino’s cashier. To play online, all that’s needed is a computer and Internet access to connect to the casino. Roulette can be enjoyed from almost anywhere. Internet roulette has another advantage-variety which we havent mentioned yet. Online players can play roulette at a variety of different casinos and in a variety of different styles of the game. There is no travel time between casinos, so a player can have one game of roulette on one screen, while another casino can be waiting on a second screen. Game variety also is easier to accommodate online. It doesn’t matter if your favourite roulette game is American Roulette or European Roulette you don’t have to travel anywhere as many casinos that offer Internet roulette offer both versions of the game. Online gamers who enjoy old fashioned casino games will truly enjoy roulette online as it is a lot like playing in a traditional land based casino. Straight Up Bet – Odds: 38:1 (American wheel)/37:1 (European wheel). Pays out: 35:1. The player places chips inside any numbered rectangle to bet on a single number. Split Bet – Odds: 38:2/37:2. Pays out: 17:1. The player places chips on the line that falls between any two numbers. Street Bet – Odds: 38:3/37:3. Pays out: 11:1. The player places chips on the outside line at the end of a row (the far line of the highest number in the row) to cover all three numbers in the row. Corner Bet – Odds: 38:4/37:4. Pays out: 8:1 Bet. The player places chips on the line at the intersection of any four numbers. Five Number Bet – Odds: 38:5/37:5. Pays out: 5:1. The player places chips on the upper left-hand corner of the number 1 on the table layout. The chip rests between the numbers 1 and 0 and covers numbers 0, 00, 1, 2, and 3. Line Bet (AKA Double Street Bet) – Odds: 38:6/37:6. Pays out: 5:1. 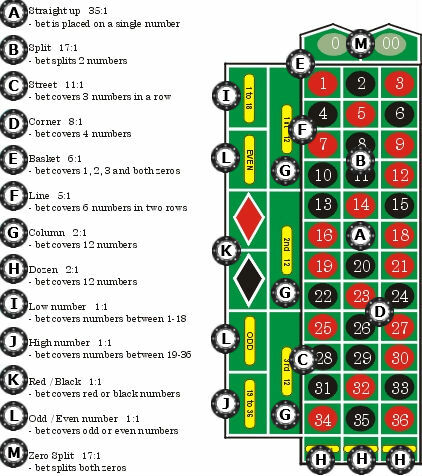 The player places chips as for a street bet, except that the chips rest on the line that intersects two rows. Line bets cover six numbers, residing in two adjacent rows. Dozen Bet – Odds: 38:12/37:12. Pays out: 2:1. The player places chips in any of the “12” boxes (1st 12, 2nd 12, or 3rd 12) to cover the 12 low, middle or high numbers on the wheel. Column Bet – Odds: 38:12/37:12. Pays out: 2:1. The player places chips at the end of a column in the corresponding 2 for 1 box to cover all 12 numbers in the column. Even or Odd Bet – Odds: 38:18/37:18. Pays out: 1:1. The player places chips in the odd or even boxes to cover all odd or all even numbers. Each box covers 18 numbers. Red or Black Bet – Odds: 38:18/37:18. Pays out: 1:1. The player places chips in the red or black boxes to cover all red or all black numbers. Each color covers 18 numbers. The Roulette wheel has a dignified mystique to it. It’s a gentlemanly way to gamble. In casinos, the roulette table is frequented by posh patrons. It’s attended to by a well-dressed croupier who sells you special chips, releases a little ball and controls your fortune with the spin of a wheel. Although the roulette wheel is a very fashionable attraction at any casino, the truth of the matter is that the game is a pure chance venture. There are no basic strategies involved. Luck is the controlling factor in roulette. Anyone who tells you that they’ve discovered or developed the perfect roulette strategy is totally delusional. There is no system that you can follow that will increase your long term odds of winning roulette. The European roulette wheel is much more player-friendly than its American counterpart. The Euro wheel has only 37 numbers. Unlike the American wheel, it does not have a double zero space. This is a huge distinction. When the roulette wheel was introduced in America, the double zero space was added as a means to maximize the house’s advantage. This advantage still exists today. American roulette wheels, with their 38 spaces, give the house a 5.26 percent advantage. If you can find a European style, single-zero wheel with 37 spaces, then the houses edge decreases considerably to 2.70 percent. That’s a 2.56 percent increase in the player’s advantage over the house. If you ever play roulette, make sure it’s on a European wheel. In many Atlantic City casinos, you can find roulette games that offer surrender. Surrender applies to outside bets that are even money wagers (high or low, red or black, odd or even). When surrender is offered, and you land on either zero or double zero (the green spaces), then you only lose half of your money. This improves the overall odds when it comes to making outside, even money bets. Surrender can drop the house’s advantage down to 2.63 percent on American wheels. That’s a huge and easy-to-notice improvement. En Prison is offered in most European roulette games. En prison is very similar to surrender. Instead of losing your chips when the ball lands on zero, your wager is put en prison (in prison). You money is left on the table and it takes an additional spin to decide whether you win this imprisoned cash or lose it. If your next bet loses, the money is gone. If your next bet wins, you get to keep both winnings. En prison lowers the already low Euro wheel house advantage to a measly 1.35 percent. This is the lowest house edge you’ll find at any roulette wheel. Roulette is a game of chance that doesn’t require strategy. Still, it’s in your best interest to look for the games that offer the lowest house advantage. Once you get to the wheel, bet however you like. No strategy can increase the odds of this random chance game.